Were you one of those kids who loved picture books? The kind of books where you found hidden characters like Waldo? Or maybe you’re still a kid or you have kids who love that sort of thing. Waldo books are pretty bulky and hard to carry around with you. Did you know there are apps that serve a similar purpose? The app store is actually flooded with them, but OUAT Entertainment’s Pure Hidden is better than all the rest. It offers a refreshing take on the classic game–sans poorly developed plot. This app offers an amazing combination of gameplay and breathtaking graphical detail. 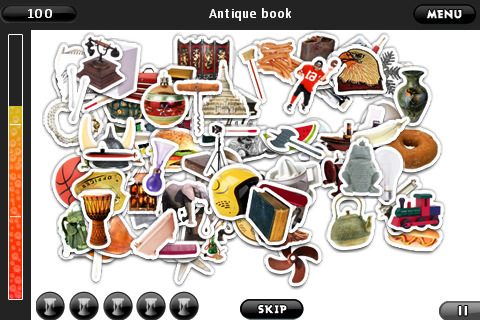 The goal of the game is to find different hidden objects located within the various levels (and their backgrounds) . You’ll have 60 seconds for each level before your time runs out. When finding the objects, you can score different stars for playing without using hints, opting to zoom, finding things quickly, and findings multiple things quickly (combo). As you unlock the different levels, new levels unlock with an animation of flowers blossoming on a tree. Pure Hidden offers a pleasurable gaming experience for the casual gamer. Controls are straightforward and easy to use. The game might even put you in a zen state with its relaxing music. If you don’t like the music or sound effects, don’t worry. They’re adjustable. And if you need to take a break while playing, there’s even a pause button you can press. If you happen to be one of those competitive types, you’ll appreciate the game’s integration with Facebook and the 400+ achievements you can unlock. Graphics are where the app really shines. There are many gorgeous, jewel-colored backgrounds within the 150 levels that you won’t tire of. The different levels are artworks in and of themselves. The art ranges from simple crayon drawings to intricate, picturesque Fabergé eggs depictions. And the animations that accompany the unlocking of the levels has a magical Disney/Pixar feel. As wonderful as Pure Hidden is, the game could use a few tweaks. Although I can understand why the developers have made the final level only permanently unlockable after users unlock all the levels, this has become very annoying. Perhaps they could have several, different pure hidden levels available to unlock instead of just the one. I hate having to wait until I obtain enough achievements to be able to play the final pure hidden level. Also, I hope the developers make good on their promises of future updates. I would love to see the picture gallery up and running so I can use one of the beautiful pictures as my wallpaper. The promised menu localization would also be a great touch. At $2.99, this game is certainly a lot cheaper than Waldo books (even the used ones). And it offers many more hours of fun so it has lots of replay value. It’s a fantastic game, but if you aren’t ready commit download the free trial version. AppSafari review of Pure Hidden was written by Linda Ta on May 11th, 2010 and categorized under App Store, Art, Board, Featured, Fun, Games, Puzzler. Page viewed 4358 times, 1 so far today. Need help on using these apps? Please read the Help Page.